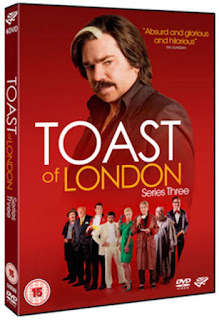 Win TOAST OF LONDON Series 3 on DVD for Christmas! The seasonal cheer just keeps on spreading! After giving away a DVD of Peep Show yesterday, I'm now giving away a DVD of TOAST OF LONDON Series 3 for one lucky reader, too! What is the name of Steven Toast's greatest acting rival and nemesis? Email me your answer here, remembering to include "Toast of London" in the subject header. One entry per household. Also include your name and a delivery address (UK & Ireland residents only). Entries received without all this required information will be deleted. The competition closes on 26 December at 5PM (GMT). Entries received after this time will be discounted and deleted. The correct winning entry will be decided using a random number generator, and announced on this blog soon after. I have no control over the speed of DVD delivery, but hopefully you'll have it sometime around New Year.